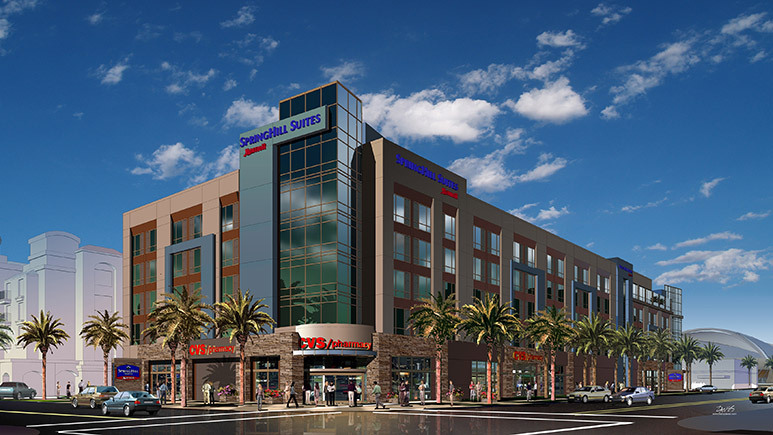 The Springhill Suites at the Anaheim Resort Convention Center is one of the newest hotels near the DISNEYLAND® Resort. 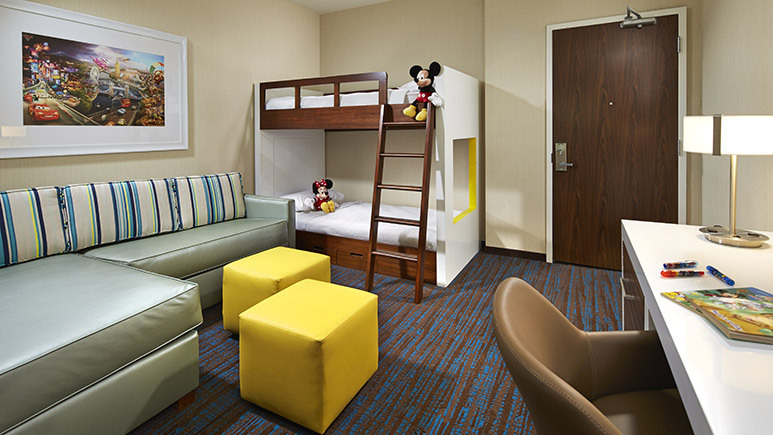 Families will love their spacious suites – including bunk bed options. Start your fun-filled day with free breakfast each morning and end your nights at the roof-top pool with a view of the fireworks! My family or Just Mom and Dad have been to Disneyland 3 times in the last year and a half or so, We are about to go a fourth time in a couple of months. This Hotel is far better than any other hotel we have stayed at. Very clean , updated rooms. The CVS on the main floor came in handy more than once. The rooftop viewing of the fireworks was also nice since we had a younger child who did not want to stay at the park late. The breakfast each morning was great. Many options to choose from and saved our family of 6 a ton of money. The walk to the park was a little long, but doable. I highly recommend this hotel. We loved the amount of space for 5 of us. It was important for everyone to have their own bed. However, a few small issues during our stay. Every night after 10 pm we had to listen to kids in the room above us running laps across the room. I called the front desk and they said they would send security to the room, but I'm not sure that ever happened. The walls and floors are thin, so you hear pretty much anything going on outside your room. The next issue was the refrigerator. It seemed to only run for 2 hours at a time. So it would only keep a minimal chill on our drinks. After a day, we started pushing the "quick chill" button as often as it would let us, just to keep our drinks cold. The nearby restaurants were convenient and cheaper than Disney. The parking at the Springhill is limited, but you also have access to another parking garage for the Courtyard next door. Not as convenient as being directly beneath the hotel, but worked out ok. The breakfast was good - the kids loved making Mickey waffles every morning, the eggs were ok, but there was a good selection to meet everyone's needs. I agree with the other comments about the rooftop pool and fireworks viewing - sounds nice but didn't live up to the hype. 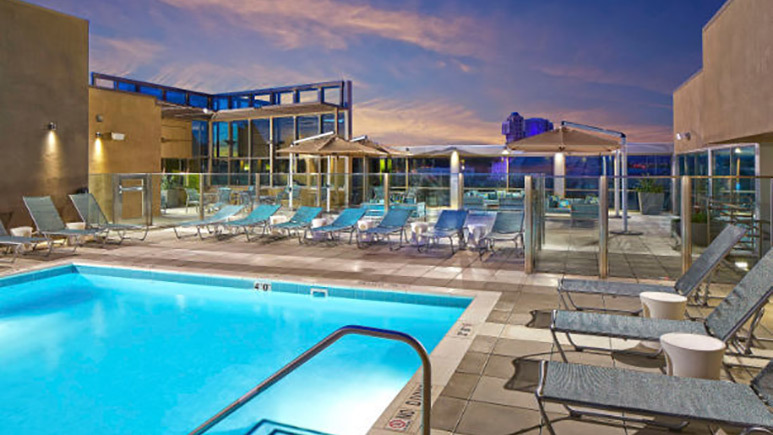 This hotel was highly recommended by more than one agent at get away today, which makes me wonder if there is some sort of incentive for pushing this one. I don’t have any complaints about the hotel, it was quite nice and the rooftop pool seemed to be a big selling feature, however December is still December, even in Anaheim which means it’s a little too chilly to be swimming in an outdoor pool, and the fact that they didn’t have a hot tub made it even less appealing to be outside. I’m sure this wouldn’t have been an issue in the summer. You could see the Disneyland fireworks from the rooftop but it was behind the somewhat dirty glass barrier. The free breakfast they serve is definitely better than any other hotel we stayed at so that was a huge bonus, plenty of options for everyone, which is nice when you have four kids to accommodate. We stayed in the kids’ suite and it was a nice, clean & modern, nice shower but no tub to bathe the kiddos, this didn't bother me as my kids are old enough for showers but might be a problem for tiny kids. In comparison to the kids suite at the Desert Palms where we stayed last time, The actual features of the room are comparable other than the door that acts as a divider from the kids space at the Desert Palms. This hotel does have a sperate space but no door to close off the space. I would have no issue recommending at this hotel to anyone, we were very happy with it and if modern decor is important to you, this is the clear choice but in hindsight I wouldn’t have minded staying at the Desert Palms again and saving myself a little cash. Hope this is helpful! The pros: great breakfast selection, clean, and comfortable!i Cons: The suite is much more like a studio than shown in pics. There is no dividing wall or door but it is roomy. The bathroom does not have a tub just a stand up shower, which is challenging with a 6 year old, 5 year old, 3 year old and 3 month old. I will be trying somewhere else next time. When we arrived it was really early for check in but figured we can ask to see if we can do as early check in, unfortunately it was not possible as it was Memorial weekend so they were all booked. But the lady at the front desk was really nice and helpful and gave us the parkin pass so we can at least park our vehicle in the garage rather than paying a lot more to park at Disney. She took my number down just in case a room would be ready earlier than 4, but no luck. So we decided to go and spend some time at Disney whole they got our room ready this was about 9 am. We came back at 3;55 pm our room wasn't ready still I though ok 5 more minutes we were exhausted we had been up since 3am that is Texas time and we 3 kids well they were grouchy! 4 came around still nothing, we waited about 15 or 20 min till finally they got us our room! I was so angry but I didn't want this to mess up our vacation and to be honest I was too tired to argue. Other than this the staff was great and friendly didn't have any other problems. One thing i also didn't like was that you can hear everything, people walking, running in the hallways. The pool area was really nice I didn't get in but the kids did and they enjoyed it, the pool is heated. You can also see the fireworks at night from the roof top so that was neat. This hotel was amazing in every way. I booked this hotel through Get Away Today and I hadn't even done a ton of research but not only was this place extremely close to Disney as well as a CVS which was great for filling up on treats for Disney but the room was clean and quiet and the beds were comfortable. The hotel roof was great for watching fireworks. The breakfast in the morning was delicious, all the kids wouldn't even dream of doing a Disneyland breakfast when we had a waffle bar at their disposal. Also, this seems like a silly point but the lobby smelled amazing, it's the little things I guess. If I had one change for this place it would be to add a hot tub. I'm never staying anywhere else in Anaheim. Great room, view, location, and best of all FREE YUMMY BREAKFAST! The whole hotel was very clean and comfortable. We absolutely loved this hotel. We booked it through Getaway Today. It was clean, the room was very nice and spacious. The free breakfast was good and had enough variety. The staff was very accommodating if we needed anything or had questions. The CVS Pharmacy attached to the hotel is super convenient for buying snacks and essentials. Conveniently located close to Disney, we walked everyday to the parks. We loved it and would definitely stay there again. It's not the cheapest place but not the most expensive either. We would rather pay a little more and have a nice clean place to stay. The pool was nice and warm and we also watched the Disney fireworks from the roof. Noisy and no customer service! I had big hopes for this hotel since they actually catered to families with children. The bunks were a great idea, but the mattresses were less than adequate. Housekeeping was a no-show on our second morning. The noise was terrible, but it wasn't the kids. We stayed in room 413. Little did we know, we were one floor directly below a fitness room housing a rack of free weights! From about 6:30 am until 9:00 am the ceiling, walls and beds would actually shake as people ran on treadmills and dropped weights right above us. We were up and going early most days so we lived with it, but on checkout day when we tried to let the kids sleep in a little, it was impossible. We mentioned it at check out and got blank stares from the two ladies working the desk, not even an apology for the inconvenience. Definitely won't be returning to this hotel for any future stays. Huge disappointment! I booked this hotel with Getaway Today, based on the favorable reviews. But, hotel was not worth the price! Expensive Parking Fee, paid at hotel. We could hear kids running up and down the hall corridors at all hours! Also, above us. And, could hear the ppl in the room next to us from the bathroom!! Beds were Very Hard. Bathroom weren't clean very well and paper products were never refilled, we had to call housekeeping for more. No Disneyland Shuttle. And Breakfast was mediocre at best. Just very disappointed with this hotel and won't stay here again. 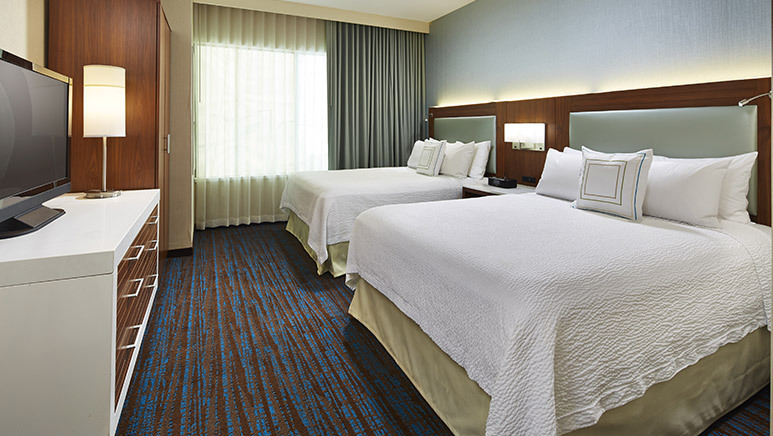 Comfy beds, clean and updated. There were seven of us so we stayed in the "Kids Studio Suite." It was awesome as we could see the fireworks from our room. Great continental breakfast as we stayed for five nights and they changed it up every day with the hot foods they served - great variety: oatmeal, waffles, cereal, breads, bacon, sausage, potatoes,eggs, fruit, milk,apple and orange juice. Very short walk to Disney and if you need to rent a scooter for any reason, rent it through the front desk at the hotel as you save $5 and it is delivered right to the hotel lobby (already for you to use). There is a CVS on the corner for any other items you'd like to buy - bring your own bags or California charges you .10 cent a bag. Front desk ambassadors very nice and helpful.Only thing that was a let down was that our rooftop pool was closed but we were able to walk about 100 ft to then next hotel and use there facilities. I would definitely stay here again - kid friendly with the decor. Great location and value for the price. Would stay again and would recommend without hesitation! No complaints. The staff was very friendly, the breakfast buffet was delicious and the rooms were great. And being able to walk to Disneyland was so wonderful. Our only complaint was that the beds were small queens and the blankets didn't cover two people comfortably. But I would definitely stay in this fun hotel again. My family of 5 stayed in a kids suite for 5 days and we loved it! Rooms were clean and spacious, bunk beds were really fun for the kids. Nice large bathroom and plenty of storage space. Rooms were very clean and comfortable. The daily breakfast was a great value, tons of pastries and cereal and it also has hot foods like eggs bacon and sausage. I will be staying here in the future we loved it that much. And it's only a short 7 minutes to the park. The last 10 years we have been going to new hotels every year, trying to find the perfect hotel. Every other hotel had gross breakfasts, dirty rooms, and basic staff. This hotel was AMAZING. CLEAN, SPACIOUS, FRIENDLY STAFF. Since our family is so large, we need the family suites with all the extra beds we could get. The first night we ordered extra towels, and since that ONE request ONE time, Every day after coming back from Disney, the house keeping always kept the bathroom STOCKED with extra towels! The breakfast is AMAZING!!! Bacon, Sausage, eggs, potatoes, along with hot/cold cereals, pastry, coffee with difference creamers, juices, milk, different types of yogurt! My husband is EXTREMELY picky and he says he cannot wait to go back next year and stay another day this time!!!! Being above CVS was AWESOME too!!!!!! Snacks, drinks and extra stuff you forgot is RIGHT THERE!!!!! This is the BEST we've found that isn't ridiculous prices. Staff was very friendly and courteous, breakfast was plentiful & always ready, the kids loved the pool and watching Disneyland fireworks from there with no crowds was a bonus. Beds were comfortable, room was spacious enough for 6 of us. I recommend this hotel to families. I love this hotel! It’s very close so we could easily walk to Disneyland. There is a sitting area and the pool on the roof so we grabbed some hot chocolate and went up there to watch the Disneyland fireworks one night when the kids were too tired to deal with the crowds at the park. Also I forgot to pack my hair gel and it was so nice to go to the CVS store below and pick some up. We also liked that the hotel had secure underground parking.